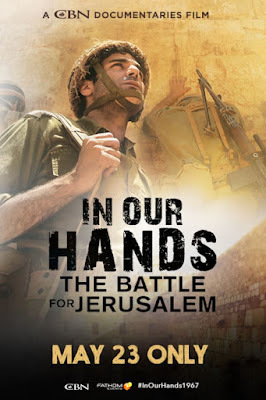 From the creators of The Hope and Made in Israel comes a CBN Documentaries Film, In Our Hands: The Battle for Jerusalem, which marks the 50th anniversary of the Six-Day War and commemorates this historic battle. For centuries, their nation had been in exile. For a generation, they had been without access to their ancestral city. For six days, surrounded by enemies, Israel stood alone … and changed history. In May of 1967, Arab nations joined together with a stated goal to wipe Israel off the map. Less than 20 years after reforming as a nation, Israel was on the verge of extinction. Yet six days in early June 1967 changed history forever. In Our Hands tells the story of Israel’s 55th Paratrooper Brigade and how Israel’s Defense Forces risked everything for the sake of their homeland. With firsthand interviews and historical reenactments, this powerful docudrama focuses on the commitment and sacrifice of the soldiers who reunited Jerusalem. Experience an exclusive conversation with Gordon Robertson, as he discusses the significance of the Six-Day War. IN OUR HANDS is in Theaters on May 23rd, 2017. Comment the Location You Want below when completed.